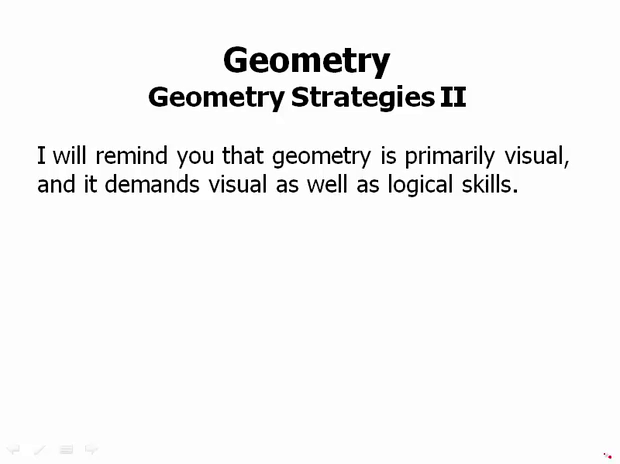 We had a video on geometry strategies toward the beginning of the module, and this videos sums up all the strategies in geometry. So I'll remind you a little bit about what I said in that first video. Remember that geometry is primarily visual, and it demands visual as well as logical skills. In that earlier lesson on strategy, I recommended that you always draw a diagram, even if one is given on the computer screen, redraw it so that you can mark it up with what you know, and what you can deduce. It may help to extend a line, or to introduce variables for lengths, or angles. Remember the discussion in that earlier video of look big versus look small. In other words, details of a relevant geometric relationship may be right next to each other in a diagram or they may be on opposite sides of a complicated diagram. Doesn't matter whether the triangle is tiny or big, the three angles in it still add up to 180. So you need to be able to train your eye to see both the small shapes, as well as the large shapes that cross over many others. Wherever there are more than two triangles, especially if parallel lines of some kind are involved, then look for similar triangles. Remember how widely applicable the Pythagorean Theorem is. Any time there's a right angle, it's worth asking yourself if the Pythagorean Theorem applies. In particular, many problems about finding the length of an altitude or the length of a diagonal are Pythagorean problems in disguise. For example, suppose in the following parallelogram, we were given the lengths b, y, and x. Well certainly, from y and x, we could find h. That would allow us to find the area. And then of course once we had h, we could calculate b minus x. If we knew b and x, we could calculate b minus x. And then we could use that to find the length of d. So we could find the area, we could find the, the altitude, and we could find the length of the diagonal. In fact, we could even find the length of the other diagonal just by drawing a similar triangle on length CD, that, the triangle AB, the little right triangle with AB as a hypotenuse. We could stick one of those on the other end and then use the Pythagorean theorem again. Of course, know the Pythagorean triplets and recognize their multiples. Remember that the two special right triangles, the 30-60-90 and the 45-45-90, can be specified with very little information but give a great deal of information. And that's exactly why the test likes them. They can just throw out one little hint, then you know you have the triangle, and then you get a ton of information. Remember that every line that crosses a pair of parallel lines creates equal angles in different places. Remember all the rules about angles and circles. There are several rules there that are important to remember. In particular, remember the two times that right angles can be specified because of circular properties. An angle inscribed in a semicircle and a tangent meeting a radius at a point, at the point of tangency. Now, in both of these diagrams, I drew the little perpendicular square. The test would not have to do that. In other words, the test could just expect you to recognize that it has to be a right angle purely because of the circular properties. My final piece of advice may seem odd, look around at your world. Look at things, look at architectural features and designs on product packaging, look for parallel and perpendicular lines, right angles, circles and other geometric figures. Practice seeing some new geometric figures each day in the world around you. This will train your brain to look for geometric patterns, and these are precisely the visual skills that you need to be successful with geometry.